Tiny Samut Songkhram province churns out salt and seafood from the Gulf along with a breathtaking array of fruits and veggies that thrive beside the inland canals. We invite you to explore these ingredients at an incredible market before learning to prepare several locally loved dishes in a tranquil canal-side kitchen. Many of the herbs used in the cooking class are grown on site, and Chin goes so far as to try out several small charcoal makers to ensure that grilled foods have the desired taste. You’ll pound spices into a paste and simmer it in coconut cream, which you’ll press by hand from coconuts that grow outside the window. 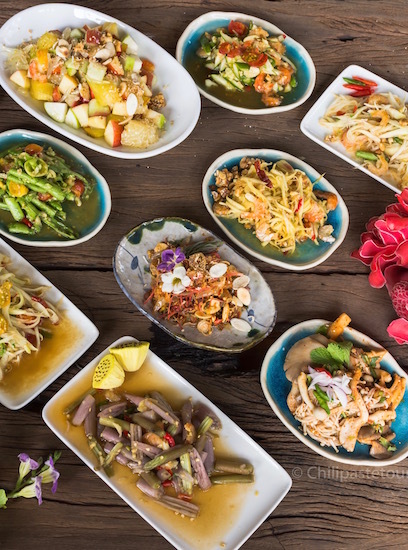 This is cooking direct from nature and the heart — the way Thai food was meant to be prepared. Chin built her kitchen 100% from scratch using many natural materials such as thatch, bamboo and coconut wood (a sustainable wood source). It’s set next to a traditional Thai house on the grounds of a coconut orchard beside a narrow waterway in the village of Don Manora. This is one of the only parts of Thailand where many people still use boats, often stuffed with fruits and vegetables and steaming cauldrons of broth for noodle soup, as their primary way to get around. While our floating markets day trip remains a great choice if you’re interested mainly in the markets themselves, the cooking option is recommended if you want to gain a deeper understanding of rural Central Thai food culture — and pick up some new culinary ideas along the way. If you like what you see but you’d like to explore deeper into the area and spend more time in the kitchen, Chin also offers a multi-day cooking adventure. 8:00: Meet at Wutthakat BTS SkyTrain Station, Exit 2, and drive for around an hour to Mae Khlong Fresh Market or Tha Kha Floating Market (which will depend on the day and your preference; the floating market is only open on Saturday/Sunday). 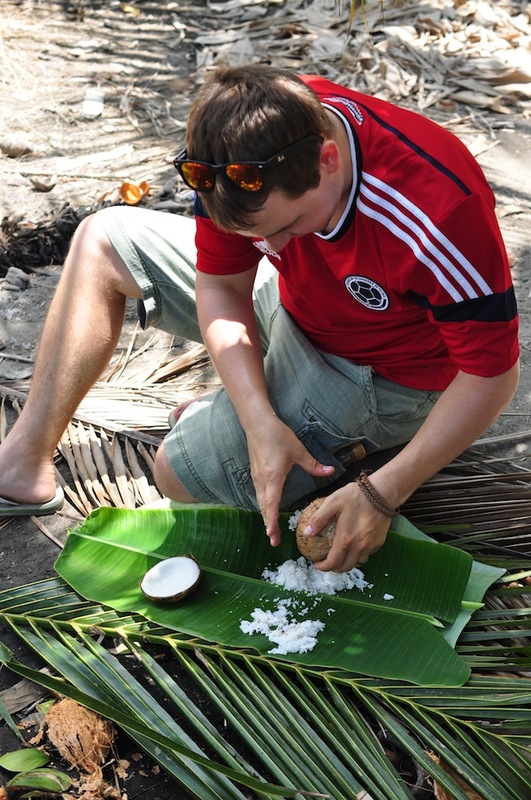 9:00 – 10:30: You’ll meet the vendors, pick up the best ingredients, try some handmade snacks and stop by a coconut farm where coconut sugar and other products are made by hand. 11:00 – 16:00: Private cooking class in Chin’s kitchen set alongside the canal in Don Manora. You’ll learn how to prepare at least four local dishes from scratch and then try out your creations in a spacious dining area. 17:30: Return to Wutthakat BTS Station. Along the way you’ll stop to see one of the salt farms where some of Samut Songkhram’s famous briny salt is produced (when in season). The class takes place beside the narrow Tha Kha Canal, in a large kitchen with proper roof and walls, windows, ceiling fan and other fans, six stoves, a traditional Thai grill, a modern bathroom with hot-water shower, and a spacious outdoor area with dining tables. It’s a relaxing place to cook and eat. Ingredients can be prepped on grass mats or sturdy counters and tables. Dozens of spices are displayed alongside types of Thai rice, noodles, and more. You can also browse Chin’s own recipe folder and photo collection labelling dozens of Thai herbs, spices, vegetables and flowers. Owner of Chili Paste Tour, Chin Chongtong is a food lover with a passion for imparting her extensive knowledge in the kitchen. 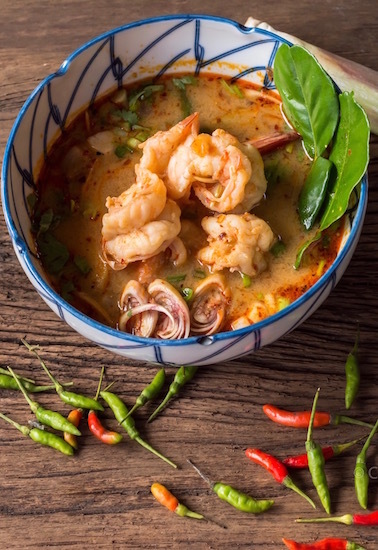 Unlike some instructors who use store-bought curry pastes and teach only “Western-friendly” Thai dishes like pad Thai and spring rolls, Chin will teach you little-known but terrific dishes using some of the more obscure ingredients, as well as better-known dishes done the traditional way. P’Paa and P’Tip help out and bring their own knowledge from having grown up in Samut Songkhram. 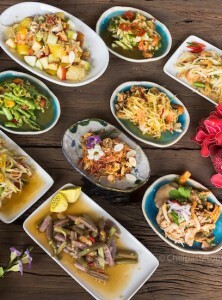 The kitchen is located around 60 kilometres southwest of Bangkok and 15 minutes from Amphawa. Tha Kha Floating Market is a 10-minute drive from the kitchen. The drive from Bangkok usually takes from one to two hours, depending on traffic. The Market & Cooking Class is a full-day tour; we suggest that you don’t make any reservations in Bangkok before 20:00. Haw Mok Pla: curry fish cakes steamed in banana leaf. Mieang Pla Tuu: sticky rice noodles and locally famous Thai mackerel wrapped with fruits and spices in local leafy greens. Saeng Wa Khung: spicy river prawn salad made with local ingredients. Yum Makrua Yao: green eggplant salad. Tom Gai Madan: sour chicken soup made with the local vegetable, madan. Gaeng Pet Ped Yang: chu chee style red curry with roasted duck. Gaeng Luang puu: Southern Thai style yellow curry with crab. Tom Klong Pla Salid Grob: crispy gourami fish soup with aromatic herbs. Gai Tort Takrai: spiced chicken skewered on lemongrass stalks and fried. Khanom Jin Nam Yaa Krathi: sticky rice noodles with spicy fish red curry. Tom Yum Kung: the quintessential Thai soup. Yum Samut Songkhram: Chin’s own salad creation featuring edible flowers, a local type of seaweed and an orange/kaffir lime hybrid. 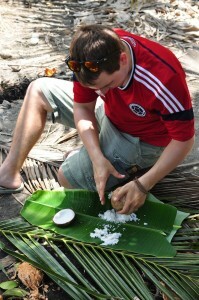 Tup Tim Grob: A traditional dessert of water chestnut and icy coconut milk. *The actual dishes prepared will depend on what’s available in the markets, as some ingredients are seasonal. However, do let us know if any of the above looks especially interesting, or if you’re keen to learn any other Thai dishes. The classes are private so there’s a lot of room for tailoring to your tastes. Vegetarians are also welcome. Every day. However, Chin is often booked in advance, so please contact as early as possible to reserve a day. For a map of the BTS sky train and MRT subway system, click here. 3,900 Baht per person for groups of 2 or more. 6,500 Baht for 1 person.